Madame D., played by the incomparable weirdo that is Tilda Swinton, is the wealthy widow who visits The Grand Budapest regularly for its timeless service and the affections of Monsieur Gustave – a paramour of many an older lady. Madame D.’s first moments on screen are also her last, as she is murdered for her fortune shortly after. Stuffy, fancy, and lavish in her dress and accoutrement, Madame D. was, immediately, my inspiration going into this Oscar blog challenge. 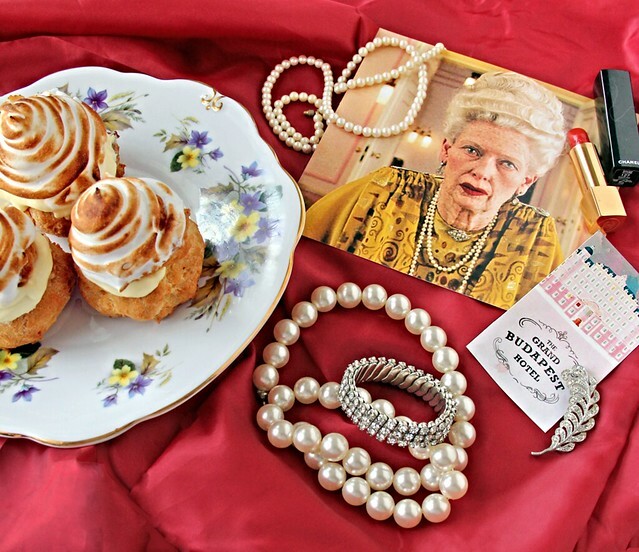 The image of her full, graying beehive and rich ochre dress quickly coaxed the idea choux pastry from my brain, developing, with time, into these gorgeous lemon chantilly cream puffs. Choux pastry, which creates the actual puff itself, is a recipe that gets a lot of flack for being difficult, but I think this largely stems from American’s lack of familiarity with it. Truthfully, it requires only a strong arm that can endure some vigorous stirring and about 5 minutes of your absolute attention. 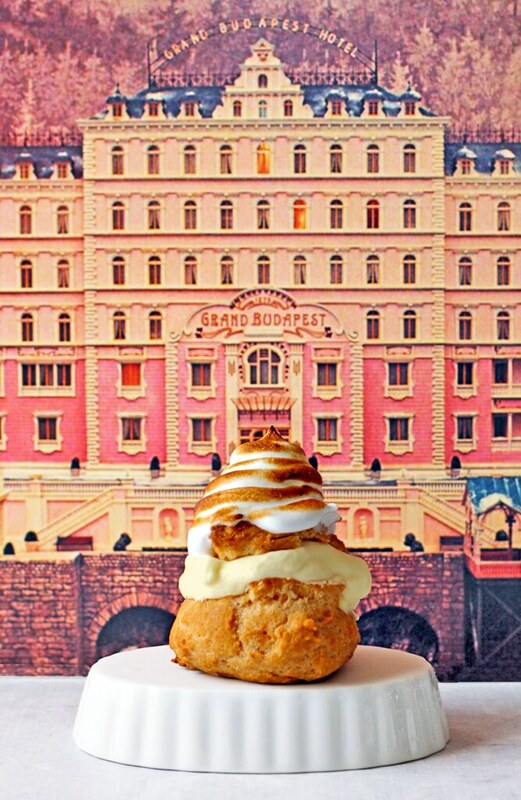 Why don’t we make cream puffs all the time, right? I know! This version is filled with a mixture of stiffly whipped cream, lightly sweetened, and then folded together with bright, zesty lemon curd. Together, they create an airy, but rich, lemon filling that is every bit as regal as Madame D. herself. I can just see her biting into one with her crimson-painted mouth right now! 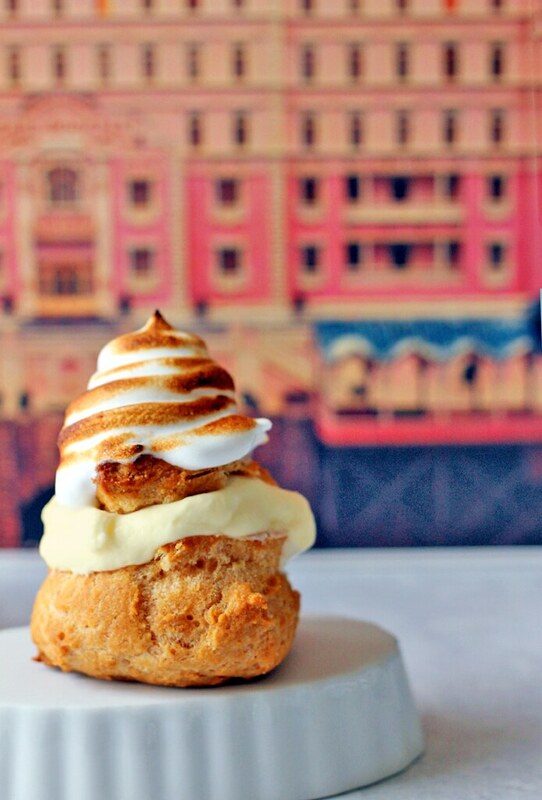 What makes these cream puffs extra fancy, though, is the lemon-enhanced meringue peaks that surround the cream puff lids in swirls and swoops, just like Madame D.’s coif. Set in the oven for just a few minutes, they toast up light brown and taste of the very best campfire marshmallow. They are as whimsical as the film itself, but, dare I say, far more delightful! 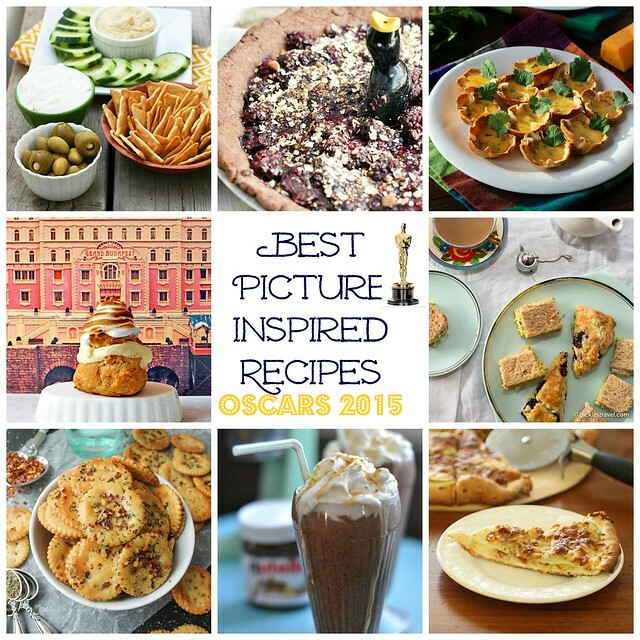 Check out the recipe for these beauties below, but before doing so, won’t you see what these seven other wonderful bloggers have concocted for their Best Picture pairings? I’m so impressed by the level of creativity here and can’t wait to try some of these delicious treats! 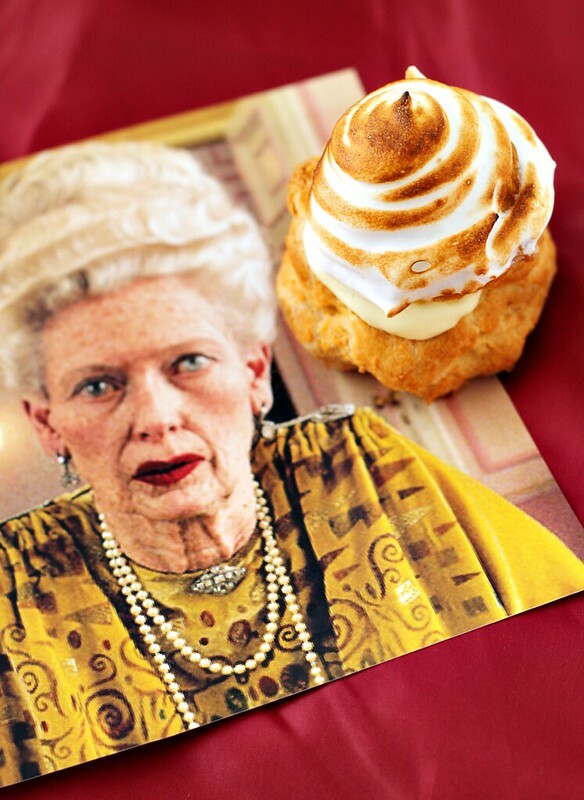 Now, onto Madame D.’s puffs! Make the cream puff shells first, noting that they must cool completely before filling. I often make them the night before and leave them out on the counter, uncovered, overnight. If you put them in a container while they’re even slightly warm, they will get doughty. Once filled, they get soft, and then soggy, as they sit, so if making them for a party or for company, fill right before you’re reading to serve. Ready? Let’s go! Preheat your oven to 400°F. Crack all 4 eggs into a pitcher, or bowl with a spout, so that they are ready immediately when needed. In a heavy-bottom pot, over medium heat, add the water and butter to the pan. When the mixture is boiling and the butter is melted, add the flour and salt and stir quickly to combine the ingredients. Continue stirring as the mixture integrates and forms a soft ball, which follows your spoon around the pot. The sides of the pot should be clean as the batter forms. Once the batter is ready, remove the pot from the heat and add one egg at a time, mixing vigorously throughout to incorporate each egg. You may need to alternate between a wooden spoon and a whisk, beating in the eggs. Your mixing should be fast and deliberate so that the eggs do not begin to scramble. The batter is finished when the eggs are all added and the mixture is smooth, thick, and holds its shape. On a parchment-lined baking sheet, form 10 evenly-shaped mounds with a slightly peaked top. I create a larger mound as the base and then a smaller one on top. If your peak comes to a fine point, gently pat it down so that it does not burn in the oven. You may also pipe the batter onto the baking sheet if you prefer. Bake the puffs for about 40 minutes or until they are a medium brown (not golden). Set aside to cool completely. In the meantime, create the lemon chantilly cream. In a chilled bowl, add the heavy cream and the sugar and beat on high until stiff peaks form. Separately, warm your lemon curd in the microwave or on the stove top, so that it is a very soft gel-like consistency and gently fold it into the heavy cream a bit at a time until it is thoroughly incorporated. If you are using a store-bought lemon curd that could do with a bit of freshness, also fold in the zest of one half of a lemon at this time. Return to fridge and allow to chill. When the cream puffs are cooled and ready to be prepared for serving, slice each puff horizontally at the point where the two mounds merge, creating a clear, wide base and a peaked top. Very gently, scoop out the base of the cream puff and discard the moist, slightly doughy center to provide maximum space for the cream. In a clean, dry bowl, add the two egg whites and the cream of tartar and beat with a mixer until foamy. Slowly add the granulated sugar and continue whipping until stiff peaks form. Once they have, pour in the dash of lemon extract and whip just to incorporate. Preheat the oven to 400°F again. Fit a piping bag with a large round tip and fill with meringue. Pipe swirls of stiff, lemon meringue around the lids of the cream puffs and place on a lined baking sheet. You could also dip and swirl the lids into peaks if you want to avoid the piping work. Bake just the meringue-covered lids for about 5-8 minutes until they are golden brown. Remove from oven and allow to set and cool while you fill the base of the cream puffs with the chilled lemon chantilly cream. When ready, top each cream puff with a meringue-covered lid and serve.